I’m still shopping for where to have Xmas dinner so we test-drived (drove?) Brasserie Les Saveurs’s Champagne Brunch (see below for Xmas menu). Has anyone watched the best drama on TV, Downton Abbey? It’s about the habits of an aristocrat family in the 20th century. How an aristocrat eats for breakfast: it is buffet-style with a butler on standby because everyone wakes up at different times. Brasserie Les Saveurs is exactly like Downton Abbey. Eating here makes me feel like a duke. See how luxurious and ducal the decor is? Floral-and-vine motif carpet of thistle color with matching beige and deep crimson plush armchairs. Three elaborate chandeliers. Tall ceiling. French windows four-storeys high, showing a view of the swimming pool with the most gigantic drawn laurel-green curtains you’d ever see. If you sit by the window, you exist in a world of your own but there is sunlight beaming in – Fann Wong and Edward Cullum from Twilight will avoid UV. There are also private rooms available. 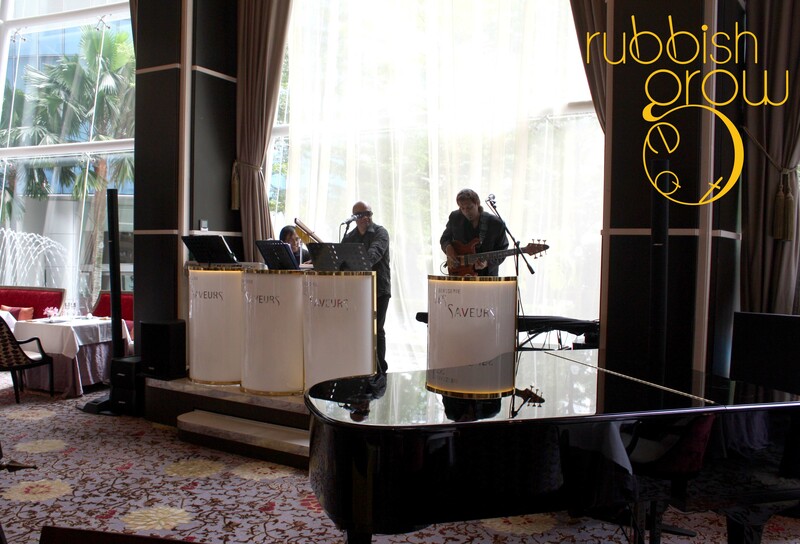 A jazz band played awesomely in the background–Mom! I found my wedding singers! Now I’ll just have to find a partner! and it is the easy part. A reservation is a must – seats were almost taken up. The service was impeccable. The utensils were changed regularly. All the servers were very friendly and cheerful and thoughtful. The angmoh maitre-d looks exactly like the handsome, villainous footman in Downton Abbey. He was carving slices of parma ham off something that looked like a huge decorative log. The helpful assistant maitre-d, Leila, talked to me and told me that the chef, who was making his rounds, saying hi, worked in a top restaurant in France. He came to Singapore six years ago, wanting to teach culinary arts, but realized his passion is still in cooking. But among all the service staff, my favorite has to be a Chinese middle-aged man. He reminds me of the butler in Downton Abbey, very no-nonsense, respectable, responsible, but underneath the strict facade, very caring. For instance, I told him my throat itched after drinking the complimentary freshly squeezed orange juice and asked if I could get honey. He immediately got a very tiny bottle of honey for me to add in my TWG tea. I was a hug away from calling him dad! One last thing I want to mention is the clientele. I recently went to a buffet in another hotel, that costs about $80. My scoop was slow-mo moving in on the ice cream tub when all of a sudden, a morbidly obese Singaporean swooped in and edged me out!! I stared at him in shock, and he said, “Soli ah” and continued scooping his ice cream. You’ll NEVER find such kiasu Singaporeans here. The elegance of the place was so pervasive that it seeped into the bones of the patrons. Everyone was courteous and polite. I’d love to live in a society like this. Let the feasting begin! The cuisine is mostly French-style. Although the range of the food wasn’t extensive, there was depth. On the buffet table, there were varieties of ham, bread, salad and cheese. For example, there were various types of salad: cucumber salad, potato salad, caesar salad, nicoise salad (with beef), grilled vegetables, asparagus, etc. The angmohs usually eat cheese for desserts, but hey, eat however you want it. Cheese with bread? Go ahead! But we skipped this because we’re typical Singaporeans, we go for the expensive stuff! 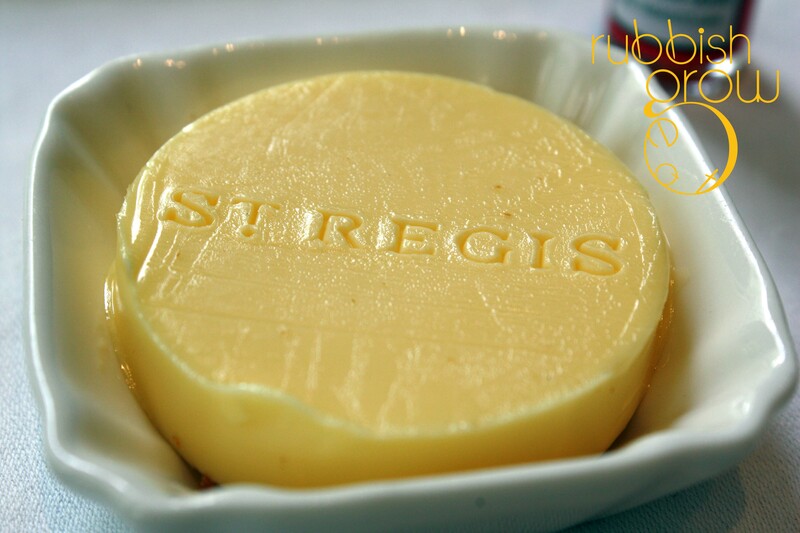 The butter, with “St Regis” embossed on it, was pretty cool. 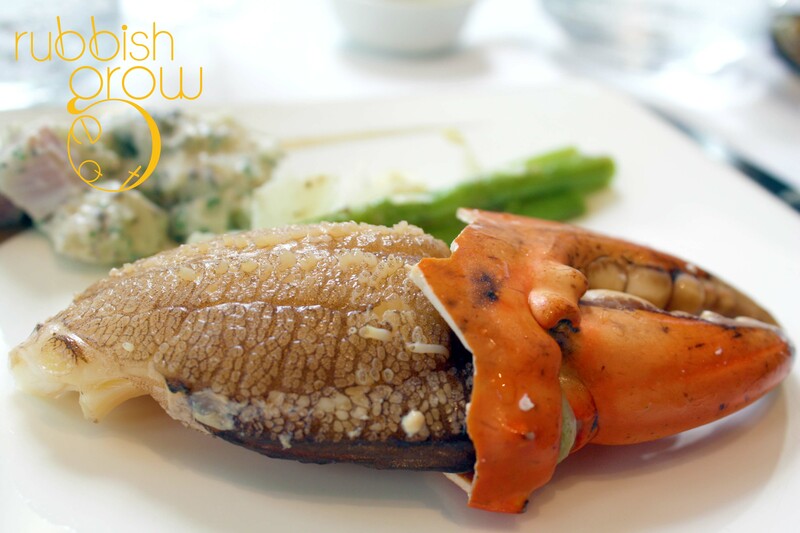 On the cold dish side, there were smoked salmon, salmon sashimi, three types of freshly shucked oysters, and crabs. Look at how ginormous the claw of the crab was! What is brunch without eggs cooked to your liking? 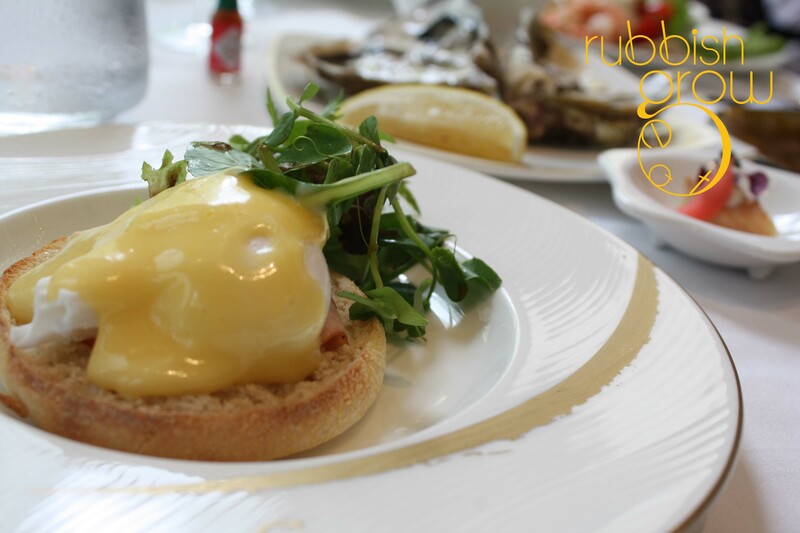 We had eggs benedict, which is a poached egg with a slice of ham and hollandaise sauce (my favorite sauce!). 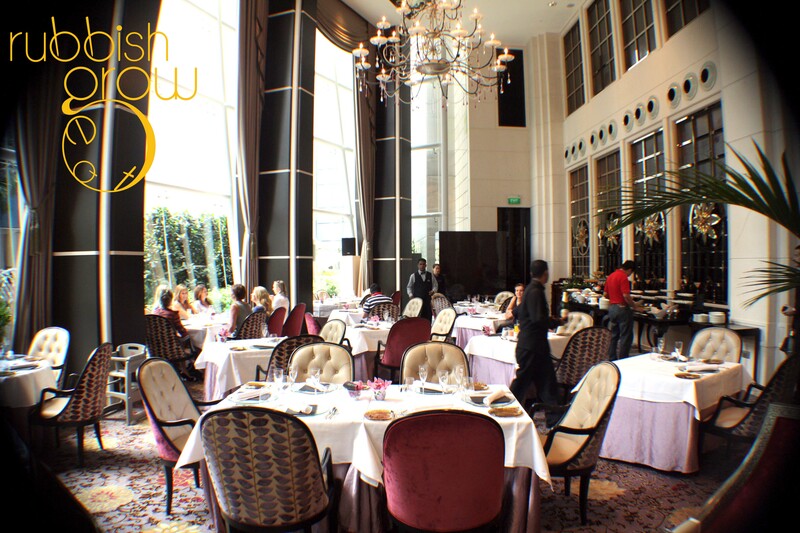 There are two cooking stations serving pan-fried foie gras and black pepper lobster. We didn’t like this perhaps because the junior chefs were in charge of cooking very complicated dishes The foie gras was too hard and the lobster was chokingly spicy. My other petty grouse for this buffet is there ought to be more hot food. Some of the food are prepared in the kitchen first and then served to each table. The portions are tiny, but these are super delicious. I wish they could be readily available on the buffet table as hot food. 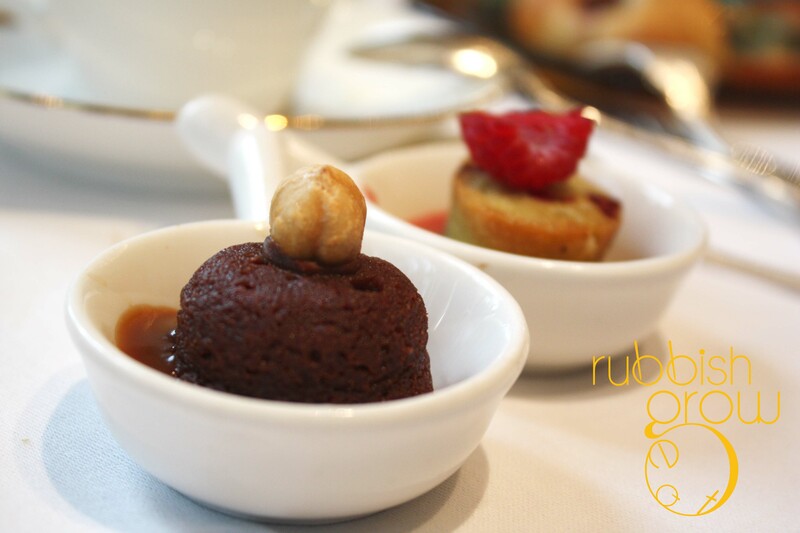 Some of the outstanding ones are: (1) Foie Gras Creme brulee with red onion compote and compressed apple – super original! (2) lobster bisque – warm, warming to the body, and bursting with wholesome flavors! (3) Artichoke risotto with aged parmesan cheese – Chiobu hated this but I loved it! You have to appreciate smelly cheese, which is an acquired taste, to like this. 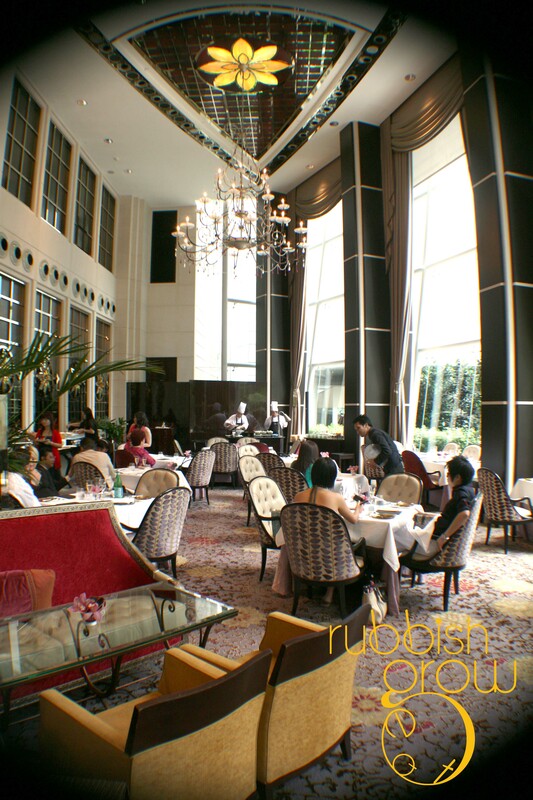 For the buffet brunch, each person is entitled to a choice of one main course from 11 choices. 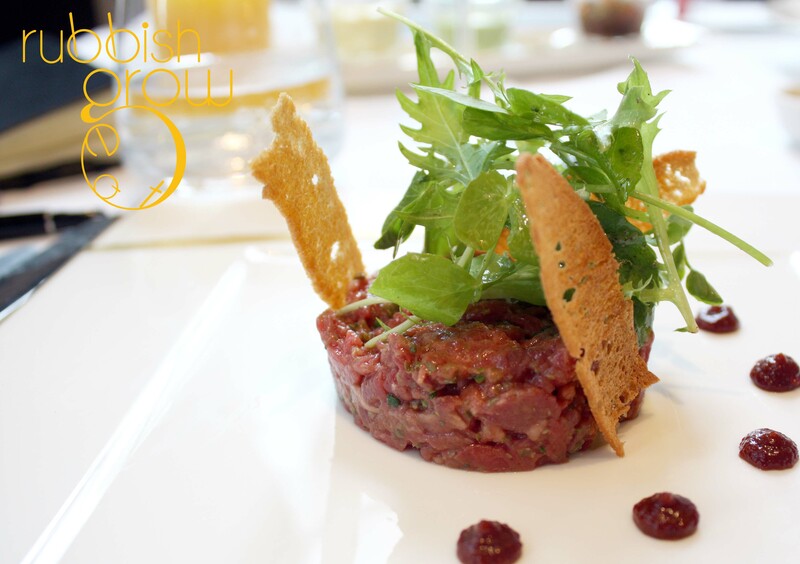 The Black Angus Beef Tartare, raw seasoned beef served in a small cake form, was zesty, onion-y, and black-peppery. 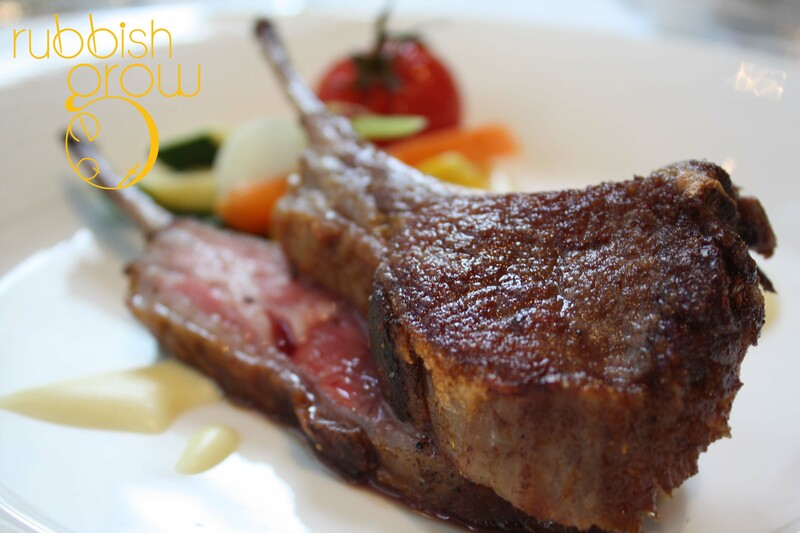 Very tasty but for those who are unaccustomed eating beef raw, you may want to skip this. I ordered the roasted lamb rack (medium-rare). Well-executed without the stench of mutton. Chiobu loved how fine the mashed potato was – but the portion could be bigger. I vowed to eat all the desserts! But I failed. Can you see the mountains of desserts?!! I doubt it’s humanly possible to try everything. 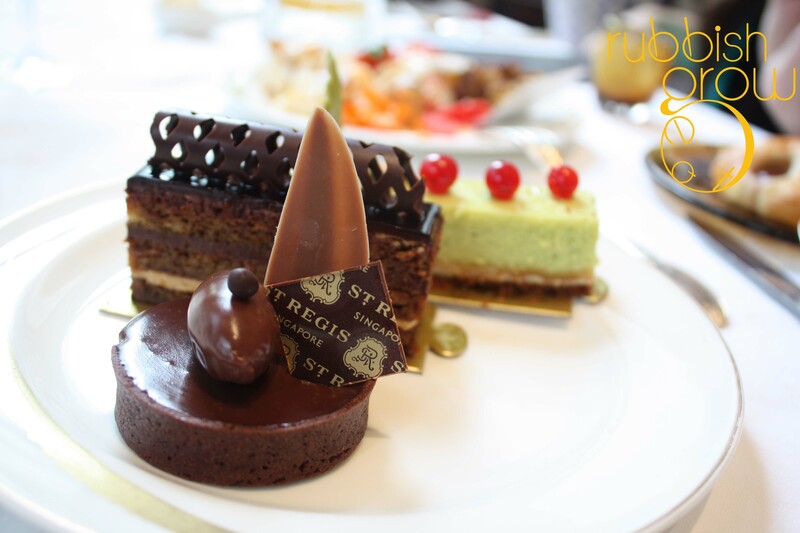 Our favorites are the macaroons, a mango lime eclair with a very surprising burst of lemongrass!, and the chocolate tart with the St Regis Sail on it. 6- and 7-course set menu dinners are available for Xmas Eve ($178+) and New Year Eve ($188++), including a glass of champagne. The buffets on Christmas and New Year at $158+ (without alcohol) and $188+ (with free flow of alcohol) have special festive menus. 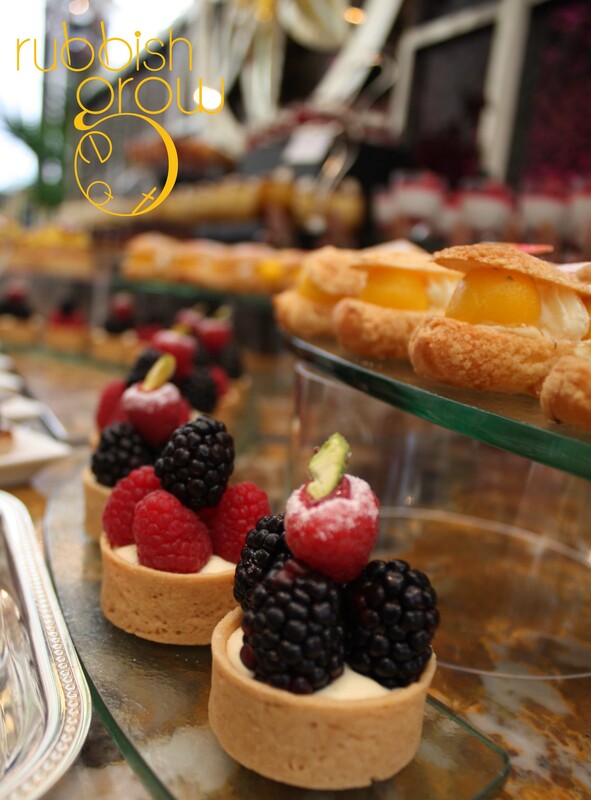 All in all, our experience at Brasserie Les Saveurs at St Regis’s lobby was leisurely and enjoyable. The ambience and service were tops. 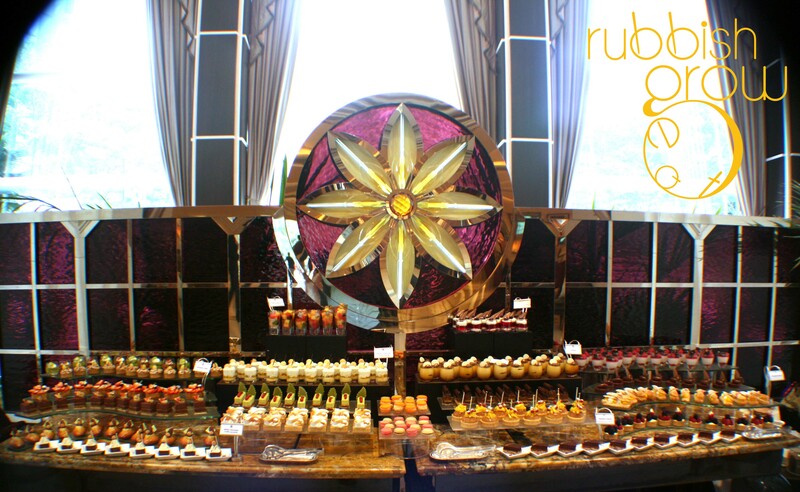 As for the food, it is different from our usual Singaporean buffets which have a wide range but no depth. Here, they serve mainly French cuisine. Therefore, a European, or a person who has lived in Europe for an extended time or a well-travelled person would appreciate the delicacy and intricacy of the food. Of course, if you can hold your alcohol, this buffet is not to be missed. haha, it’s Xmas! pamper yourself after a year of hard work. 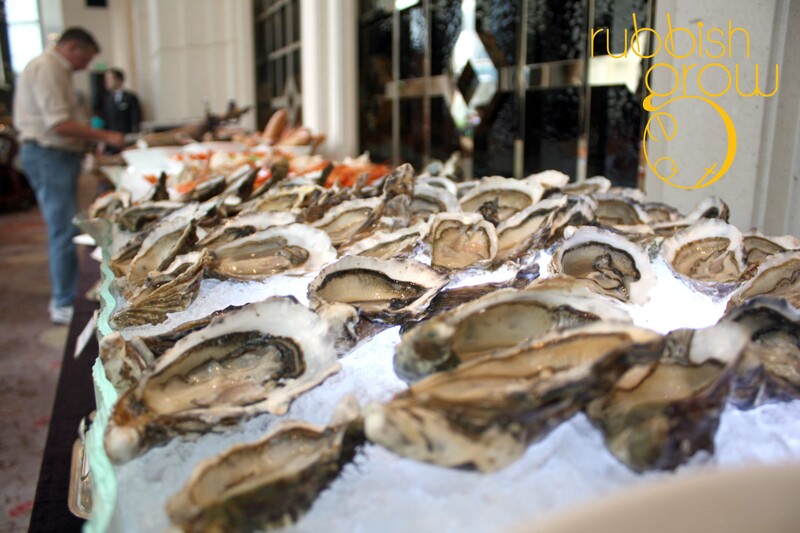 If you’re into French food, this buffet is king. I can’t help but look at this post again! How was the variety of food? Do not seems to be alot. Yeah, you’re right, it’s not a lot of variety and it’s targeted towards European taste, so I don’t know if Singaporeans will like it.